Julie and I have been volunteering for Wild Blue since May of 2018. After our kids left the nest we were looking for opportunities to volunteer for causes we liked. We toured the Wild Blue sanctuary one Saturday afternoon, met Mike and petted many cats and knew this was the place! 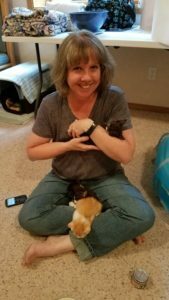 We started by fostering kittens with Michelle and we had a great experience. So great that we have become foster failures three times now! We’re taking a break from fostering for a bit while our older cat gets a little more used to the idea of kittens around all the time. We still keep busy at Wild Blue though. Currently Julie helps Jane with adoption paperwork and database upkeep. Ted keeps an eye on the website and makes sure the technical side of Wild Blue keeps running smoothly. 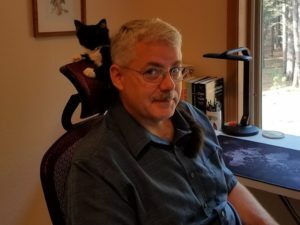 We’re proud to volunteer for such a great and caring organization, dedicated to helping kittens and cats in our area – we picked the right place to volunteer! PreviousPrevious post:He’s an orange beauty…..Uncle Ector is looking for a quiet home.NextNext post:Say Hi to Our Volunteer of the Month – Stacey! March Volunteer of the Month: Teresa! February’s Volunteer of the Month: Christine! Say Hi to Our Volunteer of the Month, Joyce! Say Hi to Our Volunteer of the Month – Stacey!